Monitor Message dashboard activity to get an overview of conversations and agent activity. 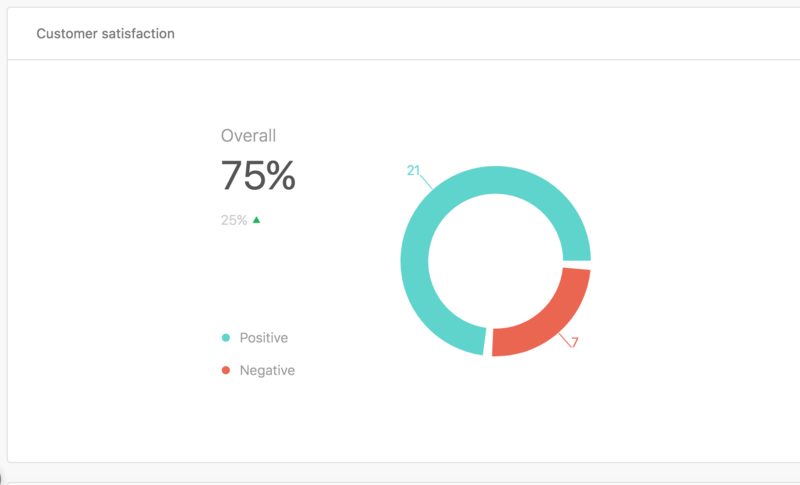 With this data, you can optimize your customer support strategy and improve its efficiency. Select the reporting icon ( ) in the sidebar. Select the Chats or Agents tab. 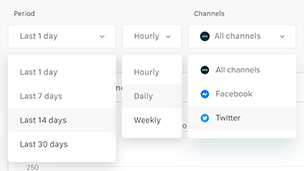 Optionally, modify the filters for time period, interval, and your channel profiles in the dropdown menus at the top of the dashboard. See Adding and managing channels for information on adding new channels and profiles. The following reports appear in the analytics dashboard. For detailed definitions of each metric, see the Glossary section below. 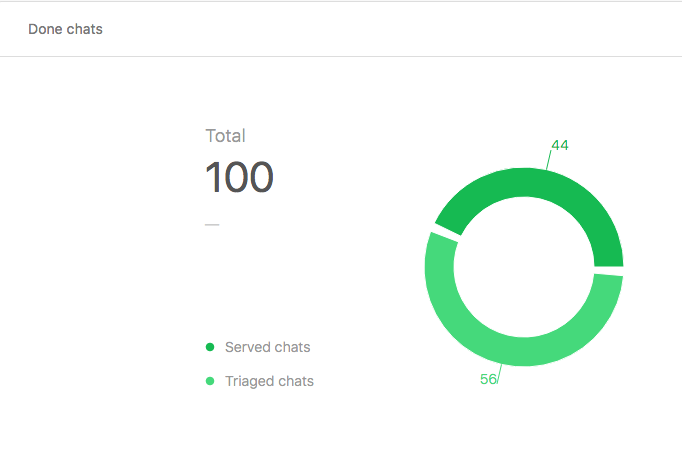 The Chats tab of Message analytics breaks down details of chats in your account. The Done chats graph shows the number of chats marked as done for the given time period, as well as the proportion of chats served by agents versus those that were triaged, or marked as done without any agent response. The Chats served by channel graph compares the number of chats marked as done from each of your channels. The average reply time graph shows the average time before a customer receives a subsequent reply within business hours for the given time period and interval, as well as the percent change. The average first reply time graph shows the average time before a customer receives a first reply within operating hours for the given time period and interval, as well as the percent change. The average resolution duration graph shows the average time elapsed before an issue is marked as Done within operating hours for the given time period and interval, as well as the percent change. The Customer Satisfaction graph shows the proportion of positive to negative satisfaction ratings for the given time period, as well as the percent change in positive ratings. The Chat timings graph shows the total number and proportion of timings metrics for Done chats in the given time period. Select one of the Chat timings metrics from the drop-down menu. 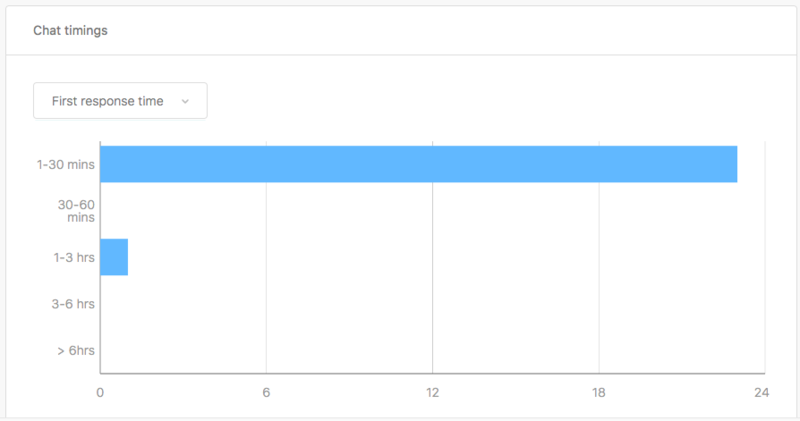 The Agents tab of Message analytics contains the Agent activity table, which shows a detailed activity breakdown for each agent in your account. Resolution duration: The average time elapsed before an issue is marked as Done within operating hours. Issue duration: The average time elapsed before an issue is marked as Done, including time outside of operating hours. Customer Satisfaction: Percentage of positive satisfaction ratings (of conversations where the visitor left a satisfaction rating). Agent messages: Number of replies an agent sent. Customer messages: Number of replies a customer sent. Response Time: Average time before a customer receives a subsequent response, including time outside of operating hours. Does not include First Response Time. Reply Time: Average time before a customer receives a subsequent reply within business hours. Does not include First Reply Time. First Response Time: Average time before a customer receives a first response, including time outside of operating hours. First Reply Time: Average time before a customer receives a first reply within operating hours. Issue Duration: Average time elapsed before an issue is marked as Done, including time outside of operating hours. Resolution Duration: Average time elapsed before an issue is marked as Done within operating hours. Customer Response Time: Average time it takes customers to respond to agents, including outside of operating hours. Is there a way of separating productivity per agent on Message? Is there a timeline of when we will be able to create Zendesk tickets for the solved Messages.